The overall software architecture is the following: the actor is the ESL (English as a second language) learner. He/she accesses the software functions via the Duenna User Interface (UI). The said UI allows the ESL learner to select a conversation from various topics that illustrate a grammatical area, e.g. past tense, etc. Then the software plays back the conversation using comic-like imagery, and utilizing TTS voices. The application thus makes use of an external web service (Acapela VAAS) and also software resource files such as facial expression images, background audio and background images. The principal software functions are: the Duenna graphical User Interface enables the learner to observe an imaginary situation that is played back using photos of actors and utilizing TTS voices. Additional functionalities include a window where grammatical explanations are shown and the software can also show the conversation transcript. It also allows the user to pause and resume the conversation being played. The learner can select from a variety of topics and conversations belonging to a certain topic. The Main class provides services and functions to the overall application, such as tracking the actual conversation, controlling the state of the application and triggering additional sub-functions. Such sub-functionality includes for example the configuration window (Settings), the conversation Transcript window and the grammatical explanation window. The Main class also accesses the external third party TTS webservice (Acapela VAAS). The software only needs time to load the voices which, in turn, depends only on the speed of the Internet connection. 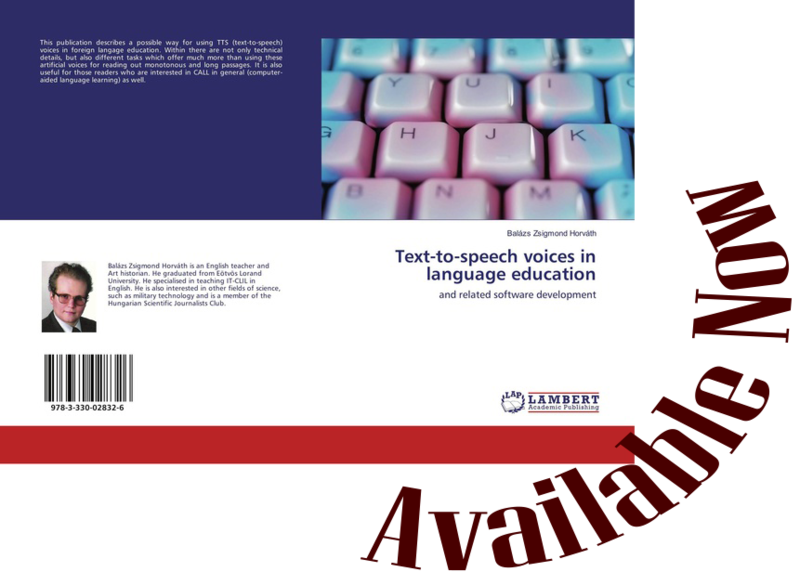 The presented TTS application is an auxiliary tool for language teaching. It utilizes computer-generated voices to simulate dialogs representing different grammatical problems or speech contexts. The software is capable of demonstrating as many examples of language as required to enhance the language learning experience. Thanks to the run time environment, it runs perfectly on low-end machines. It proved to be loading at a rate of 1.55 s faster compared to the closest avatar-oriented TTS teaching solution found on the Internet at the time of submitting this article (based on Gtmetrix page performance diagnostics results). The overall software architecture is the following: the actor is the ESL (English as a second language) learner. He/she accesses the software functions via the User Interface (UI). The mentioned UI allows the ESL learner to select a pre-saved interview from various topics that illustrate a situation in an imaginary interview. Then the software plays back the conversation using a comic- like imagery, and utilizing TTS voices. The application thus makes use of an external web service (Acapela VAAS) and also software resource files like such as facial expression and background images. The principal software function are in the graphical User Interface which enables the learner to observe an imaginary situation that is played back using photos of actors and utilizing TTS voices. The learner can select from a variety of interview situations.